This wheel chair cushion is made with 4 layers of pressure relieving medical grade foam. The top and bottom layers use visco memory foam. The multiple foam densities provide different levels of pressure redistribution and comfort. The cover has a anti skid bottom and the top is low shear to protect the skin from shearing. This wheelchair cushion is designed to redistribute pressure while providing the patient with a soft comfortable support surface. 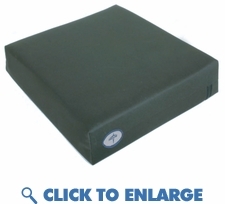 This standard wheelchair cushion is easy to transport and the cover is removable and washable.